Bharat China relations are entering a delicate phase this year. With the ascension of Xi Jin Ping as the Supreme Leader of China, we should expect a subtle change in the attitude of the Chinese. Meanwhile, our polity is hardly bothered by the changing nature of the global power architecture. A few days back, we had seen how the ascendancy of Xi Jin Ping can impact Bharat in military as well as non-military ways. In this article, we will understand how China is encircling Bharat by forging new relationships, indulging in financial blackmail and deepening of trade ties with other countries. Readers will remember that last year, Bharat-China relations came under a lot of strain because of the Doklam faceoff. For several months, units of Bharatiya and Chinese military were locked in an eyeball to eyeball confrontation, determined not to back off. At stake was the control of the Doklam plateau which has a strategic importance for Bharat. Finally, the Chinese backed off in this battle of the nerves. Expectedly, a section of the Bharatiya media went to town and exulted that 1962 had been finally avenged. But earlier this year, the PLA re-entered the Doklam territory and made its intentions clear. ‘China will not stop at any sacrifice to defend its borders,’ so said President Xi, fresh after his re-election as the China supremo. For Bharat, this is a valuable lesson. The Chinese love the game of deception as prescribed by Sun Tzu. We, on the other hand, take pride in winning small wars. For us, there is little difference between strategy and tactics. Meanwhile, China continues to exert pressure on little Bhutan. The former wants this little Himalayan kingdom to dilute its special relationship with Bharat. This is one way of exerting pressure on our borders from the Himalayan side. Eminent security expert Brahma Chellaney has warned in his latest article that after Tibet, Nepal could be our next nemesis. Writing in Asian Nikkei, he says that China is steadily building up its presence in Nepal. The former had convinced the two communist parties in Nepal to come together in the general elections and win them. And sure enough, today we see a communist government headed by K.P Oli which is determined to cut down Bharat’s influence in Nepal. Various reports tell us that China is increasing its investments in Nepal at breakneck speed. A 2017 article in Nepal Energy Forum says that Chinese investments in Nepal were three times the investments of Bharat in the first 10 months of last fiscal. The Nepalese Department of Industry reported that in the said year, Chinese invested 29.8 billion dollars in Nepal while the corresponding Bharatiya value was just 8 billion USD. Even in terms of numbers of projects, China is far ahead of us- 108 versus 18! It might be argued that China’s investments in Nepal are a subset of the latter’s global exposure. But there is a perception that there is growing resentment against Bharat in Nepal. Whether this resentment bordering on hostility is real or imaginary, it is up to the Bharat Sarkar to deduce. The Diplomat connects the growing Nepalese affection for the Chinese to allegations of an undeclared blockade of the Himalayan country by Bharat in 2015, during the Madhesi and non-Madhesi conflict. SAARC does not have any tangible benefits for Bharat. The only advantage for us is that this body makes us look like a Headmaster of the South Asian region. Over the years, unimaginative foreign policies had reduced us to being just a South Asian regional power. China was happy with our role as this situation helped it to expand its footprints globally. But China is not just content at limiting our role to South Asia. It wants a seat in this body also! For some time now, China has been convincing Nepal and Pakistan to canvass support for a seat among other member nations in SAARC. If that happens, then it is easy to imagine about Bharat’s role in regional and global affairs. Not surprisingly, Bharat is working very hard to limit the Chinese influence in Nepal. But this is, at best, a knee-jerk reaction. 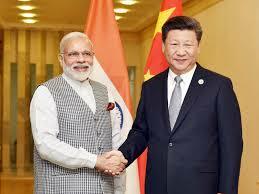 The problem in Bharat China relations is one of our attitude. While we are reactive, the Chinese pretty well know what they are going to do in the short, medium and long terms. China under Xi Jin Ping has its sights fixed on 2050 by which time it aims to be a global superpower economically as well as politically. In order to achieve this goal, it is determined to use all kinds of methods- ethical or non-ethical. This is a major break from the Deng Xiaoping years when the Chinese focused on making their economy stronger economically. Today, China is indeed an economic powerhouse; it has a global share of 13 % in all exports. To keep its sea lanes safe and secure, China is actively wooing small countries in the warm oceans. Maldives fits in the Chinese strategy of securing warm water ports, neatly. This island nation is also heavily indebted to China and this makes it an easy prey for the former. This country has ‘secretly signed a free trade treaty’ with China which is a major cause for worry for Bharat. But here, China has run into some kind of a problem with Bharat. Maldives is closer to Bharat than to China and it is in our interest to prevent the Chinese from establishing their base in that island nation. However, it seems that we have become a deer caught in the headlights of an approaching car. Our government is confused about the next course of action. Should it or should it not interfere in the affairs of this island nation? Carnegie indeed thinks that Bharat can and should influence the events of Maldives. And why not, it argues further. After all, we have gone into Bangladesh, helped Nepal draft a new constitution and fought along with the Sri Lankans against the LTTE insurgents. In the case of Maldives, Bharat has indeed shown some resolve in recent days. Unconfirmed reports say that a few days ago, our warships had prevented Chinese vessels from approaching the Maldivian waters. Perhaps the biggest threat to Bharat’s security comes not from Pakistan, but from Sri Lanka. We spent a good many years to put down the LTTE insurgents in Lanka and even lost several valuable lives in the process. We had imagined that with LTTE gone, Sri Lanka would be a safer place for us. Read this New York Times news report which says that Sri Lanka has handed over its Hambantota port to the Chinese for its operation. Like the Maldivians, the Lankans are also burdened by debt and the best course for them to wriggle out of this position was to give away Hambantota. The same report says that Lankan firms owe USD 8 billion to China. Hambantota is valued at just USD 1.1 billion so there can be some other concessions that Lankans might give to the Chinese. Bharat-China relations must not be viewed through the prism of 1962 and Doklam. We need to engage with China at various levels. Unless we develop a strategic vision, we will find it difficult to compete with the Chinese- economically, politically, and militarily. Among the general public, there should be a greater understanding of China, its intentions, and this country’s thought processes. More importantly, we as a nation must have a long term vision to re-define Bharat-China relations.